About 80 years ago Alfred Date knitted his nephew a sweater. Today Mr.Date is Australia’s oldest man at 109 years old but he is still knitting. Last March Philip Island’s Penguin Foundation appealed to knitters across Australia to knit wool sweaters for penguins to wear in case of an oil spill. Oil is toxic for most marine life but it is particularly harsh on penguins. Oil mats and clumps penguin feathers thereby diminishing the birds’ ability to insulate themselves from the cold. The sweaters also prevent the penguins from ingesting the oil while trying to clean themselves. Penguin sweaters have become an important part of oil spill response since 2001 when 438 penguins were dressed in sweaters to cover their oily feathers and 96% survived – a remarkable rate. MSN reports that Alfred and many of the other residents and nurses of his nursing home heeded the call and began knitting dozens of penguin sweaters. Philip Island in Australia is home to 32 000 little penguins –so called because they only grow to a total of 33 cm – and it is thought that the sweaters will help preserve the colony in case of an oil spill. Alfred says that he is self-taught and in addition to penguins he knits scarves for his friends and donates toques to babies born prematurely. Notes: Cover photo credit – The Penguin Foundation. 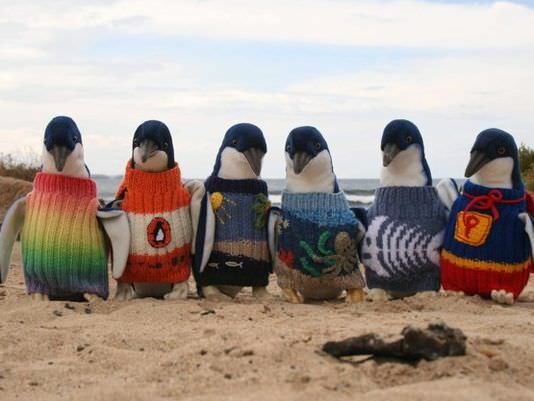 The penguins in the photo are not real but just stylish mannequins modelling the sweaters. The Penguin Foundation is not currently in need of any more sweaters but does encourage donations to help their conservation efforts and you can even adopt a penguin!